This post is about a tool called NameChk, a tool that helps you search across multiple platforms to see if a username is available. I really wanted to share that with you, and the rest of this is an anecdotal case where I wish I had known about it earlier. I recently had the opportunity to provide coaching to a marine consignment shop in Oriental, NC. We did a little crash course in how they could use social media tools to stay in touch with people who visit their shop and to introduce themselves to people who would probably be coming by boat to Oriental in the coming season. I sketched out some goals, prioritized the order of those goals, and made sure they knew that they could use these tools anyway they like. I gave them some ideas of posts to get them started- but I had the feeling they also needed some pieces of the bigger picture. They’ve just bought the shop, and they’re new to branding. I started with a google search, and realized that even though I had been to the shop earlier that day, I didn’t know the name of the place. So I asked. “It’s either Oriental Marine Consignment or Marine Consignment of Oriental,” she said. Oh poop. No blame, no shame. Here’s where a good friend and good consultant steps in and advises. On a google search, both are going to come up, but you definitely don’t want to have this on your business card, that on your twitter account, this other logo over here that has it one way, and then your sign on the door says it another. So I backed it way up. Instead of rushing into setting them up with a page, which feels really good to do at a consult like this, I made sure to drive home my points about having a logo, sticking with a voice, and definitely, deciding what your business name is so people remember it and know it’s you talking. That’s kind of odd, and we don’t think about it a lot of times, but if someone were to freely and subtly move from one business name to another in the course of a conversation, it’d seem kind of sly and you wouldn’t be sure that you were talking about the same company. That uneasiness betrays the trust part of having a relationship with a brand. So enter NameChk. Let’s say you’ve got everything else together. You know what your business is called, you have your logo and your branding- now you’re going to go out and set up some accounts with social media outlets. How sweet would it be to have the same username everywhere? This makes it easy for people to find you everywhere. I don’t have the same name everywhere. My business used to be called Wicked Neat, and people know me as that on twitter. I could change my username on there, but I’m still not sure about it. What do you think? Should I be righthandanne on twitter? Does it matter? 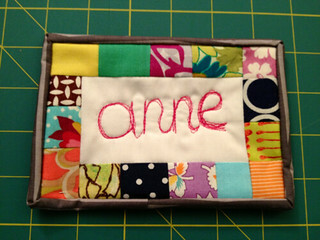 This entry was posted in Helpful Things and tagged accounts, branding, business, NameChk, social media, trust by Anne. Bookmark the permalink.